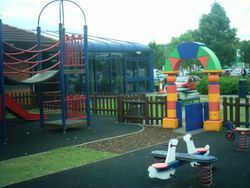 The following services have a children's play area, either indoor or outdoor. Further details on each of the services can be found by tapping it's name, however you would prefer to go to Services Search and tick the 'children's play area' box, as it will allow you to further customise the search. Since the 1990s, services have included increasingly larger play areas to help children let off steam. Donington and Leigh Delamere have begun a trial with large soft play areas. Pages in category "Children's Play Areas at Motorway Services"